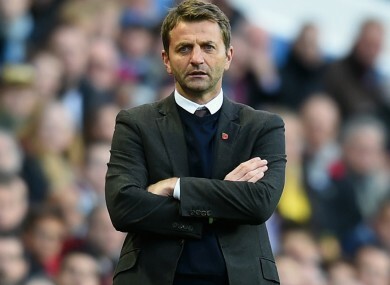 Tim Sherwood has lamented his time at Villa. SACKED ASTON VILLA manager Tim Sherwood claims he was not involved in the final decision making for any of the club’s signings in the off-season. The 46-year-old was let go by Villa after the club’s disastrous start to the Premier League season last month. Villa sit bottom in the table after picking up just one win from their opening 11 games. And now Sherwood has hit back at the club, claiming that all of Villa’s signings were decided by a committee – with owner Randy Lerner having the final say. “There was a committee, which I was part of — so I had a say in the players I wanted to bring into the football club,” he told beIN Sports. “We ended up signing 12 players, although there was a lot more players given to the committee than 12, and we ended up with what we ended up with. “I believe that those players in time will be good players for the football club, but when you bring in a lot of players from other countries that have not played and experienced the Premier League before, the competitive nature of it, it is going to take time. “I certainly had a say, but the final say? It was more of a combined collective decision and ultimately the man who puts his hand in his pocket is the one who has to make that decision. Email “'I did not have final say on Aston Villa signings'”. Feedback on “'I did not have final say on Aston Villa signings'”.